Who ever thought we’d have Russian fur traders and Spanish Franciscan Fathers to thank for pioneering Sonoma County’s winegrape growing success? It’s been almost 200 years since Russian colonists planted what are believed to be the earliest-known winegrapes in the county. Any grape-growing influence they may have had was very short-lived, however – in 1841 they were forced from Fort Ross, which they had founded in 1812. But their agricultural influence inland from Fort Ross served as the foundation for today’s Russian River Valley. Meanwhile, the padres, who were building missions throughout California, planted rows upon rows of vineyards in 1824 at their northernmost site, San Francisco Solano, in order to produce sacramental wine. The wine was an important part of Spanish religious culture, though not the quality you’d enjoy with dinner and friends. In 1834, a major shift occurred in winemaking – moving from the altar to the dining table – as the Mexican government began secularizing the missions. It asked General Mariano Vallejo, the military governor of California, to oversee the process at San Francisco Solano. Vallejo established a town, which he named “Sonoma,” around the mission. He made the town his home and began cultivating wines with some of the mission’s grapes. Cuttings from the former mission’s grapevines were used to start new vineyards throughout the northern California territory. Throughout the 1840’s, mission and non-mission winegrapes began taking root throughout present-day wine regions: Alexander Valley, Glen Ellen, Dry Creek Valley and Sonoma Valley. Agoston Haraszthy, a Hungarian nobleman, arrived in Sonoma Valley and purchased the Salvador Vallejo vineyard in 1855, bestowing on it a new name, Buena Vista. Today it is the oldest functioning winery in California. According to legend, Haraszthy quickly became a key figure in the California wine industry. Commissioned by the state legislature to study European viticulture overseas in 1861, he returned to Sonoma County a year later with more than 100,000 cuttings of about 350 prized grape varieties from France, Germany, Italy and Spain. When the state wouldn’t reimburse him for his trip, he was forced to plant, cultivate or sell the cuttings on his own. He wound up planting many within the county, dramatically increasing its winegrape acreage. He also experimented with innovative grape-growing techniques that he learned while overseas, including planting rows closer together and on hillsides. Haraszthy’s efforts in creating the commercial wine industry, together with the success of General Vallejo’s award-winning wines from his own vineyards, elevated the county’s winegrape-growing ability to compete with Europe in creating fine table wines. 1873 saw an outbreak of phylloxera, an American root parasite that destroys grapevines. Introduced into Europe in the 1860’s where it wiped out almost all vines, it likely was brought back over with the immigrants. The young vineyards not immune to the disease were nearly destroyed. But disease-resistant vines eventually were found and varietal shoots were grafted to these hardy stocks. Sonoma County survived the debilitating phylloxera epidemic, and over the next 30 years rebounded to 256 wineries. But growers were about to suffer another blow: the United States government in 1919 decided to shut down the commercial wine industry with the 18th Amendment and passage of “The Volstead Act”—collectively known as Prohibition. While the wineries not making “sacramental” or “medicinal” wine were closed, grape growers actually flourished. How could this be? It’s because the demand for grapes from home winemakers was so great. Thanks to a legislative loophole allowing 200 gallons of wine yearly for home production, more than 150 million gallons were produced in hundreds of thousands of households in 1930. The grape production reported for Sonoma County totaled 21,300 acres in 1930, almost reaching pre-Prohibition figures. In 1933 the prohibitive Volstead Act was repealed, but for hundreds of wineries across California, it was too late: only 160 of the state’s 700 wineries remained. The surviving wineries had endured by producing sacramental wine and grape juice or by planting other crops. Some pulled out their vines; others planted other fruit crops between the wine rows. Sonoma County’s wine industry underwent a slow revival in the late 1930’s, thanks in part to World War II preventing French wines from coming to America. Small- to medium-sized wineries sprang up in Alexander Valley, Dry Creek Valley and the Russian River area – places that had experienced limited growth in earlier years. Many of the wineries immediately began producing bulk wines that went to bottlers outside the county. Grape and wine overproduction in the post-war 1940’s slowed things down even more, as the government implemented pro-ration and set-aside programs to cope with the glut. Despite this, second-generation Sonoma County wine industry pioneers were joined by those who left business, commerce and trade to work alongside them to rebuild the wine industry. The 1960’s – the decade that redefined so many facets of American life – saw the wine boom hit across the country. Orchards were pulled, grazing land was plowed under for vineyards and, for the first time, white grapes were predominant. The winemakers were heeding the tastes of the American consumer. Sonoma wineries, and the wine they produced, underwent a transformation throughout the 1970s and 1980s – just like wineries outside the county and the state were experiencing. 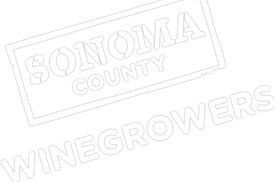 For much of the 20th century, Sonoma County was known for growing grapes and producing bulk wines; after all, many immigrant settlers here farmed winegrapes for use in jug wines. The winegrape played second-fiddle to fruit, grain and dairy in terms of profit; it wasn’t until 1989 that it became the highest-revenue-generating crop in the county. Technological advances during this period brought stainless-steel fermenters and crusher-stemmers to wineries in order to automate and improve production. Americans were being more selective about what they drank, thus bulk wine lost its appeal as the demand for higher-quality wines rose. Viticulturists were retiring to labs and appearing with exciting new varietals to appeal to our increasingly discerning tastebuds. This helped fuel the move toward labeling wines by their primary grape variety, rather than as generic table wine. As the popularity of wine increased throughout the 1970s, more wineries sprung up throughout the county. By 1978, American Viticultural Areas (AVAs – also known as an appellation) were being established and became an important part of the marketing of Sonoma County wines. Today, Sonoma County is comprised of 16 unique appellations. Its varied topography – the foggy Pacific Coast, rolling hills and valleys, and steep mountain ranges – is home to 66 grape varieties, including 44 red and 22 white. You’ll easily find traditional Bordeaux grapes here, but you’ll also discover some lesser-known grapes, including Carignane, Roussanne and Tinta Cao. Sonoma County harvested over 271,000 tons of grapes in 2013 from the region’s roughly 64,073 acres, valued at around $605 million. This represents the largest recorded wine grape crop in the history of Sonoma County. There were over 685 bonded wineries in 2012, up from 58 in 1969.